This guide is for the remedies and tools you can use for holistic weight loss and wellbeing during your weight loss journey. It is not a diet and exercise guide and you will obviously still need to make the right nutritional choices. Basically, weight loss is simple maths: If you consume less calories than you spend, you will lose weight. What the tools and remedies listed below can do for you is act as a support on the journey. NB. Always consult a medical health professional before changing your diet drastically if you have an underlying medical condition. 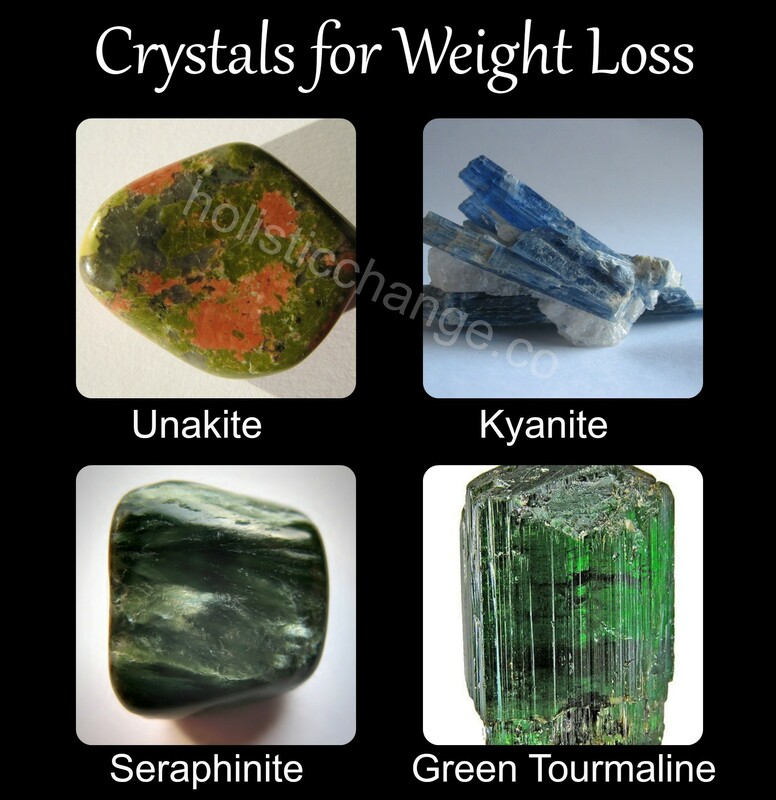 According to Judy Hall, author of Crystal Prescriptions, some of the best crystals to use for weight loss are unakite, green tourmaline, seraphinite and kyanite. I also like to include green aventurine for general wellbeing. You can make a crystal essence with these crystals and drink it first thing in the morning, wear them as jewelry or carry them with you in a mojo bag. Good sleep is essential for weight loss, so I recommend sleeping with an amethyst cluster under or next to your bed, possibly in combination with smokey quartz if you are suffering from anxiety/depression. Green tea speeds up the metabolism and helps detoxify your body. Toxins make you bloated – the water retention they cause is your body’s defense mechanism for diluting the toxicity. Green tea helps rid your body of the free radicals and the water retention. Ginger also speeds up your metabolism and can help suppress your appetite. As ginger also has anti-inflammatory properties, this is a great spice for keeping you healthy during your weight loss. Try each of them for yourself and see if you notice any difference. 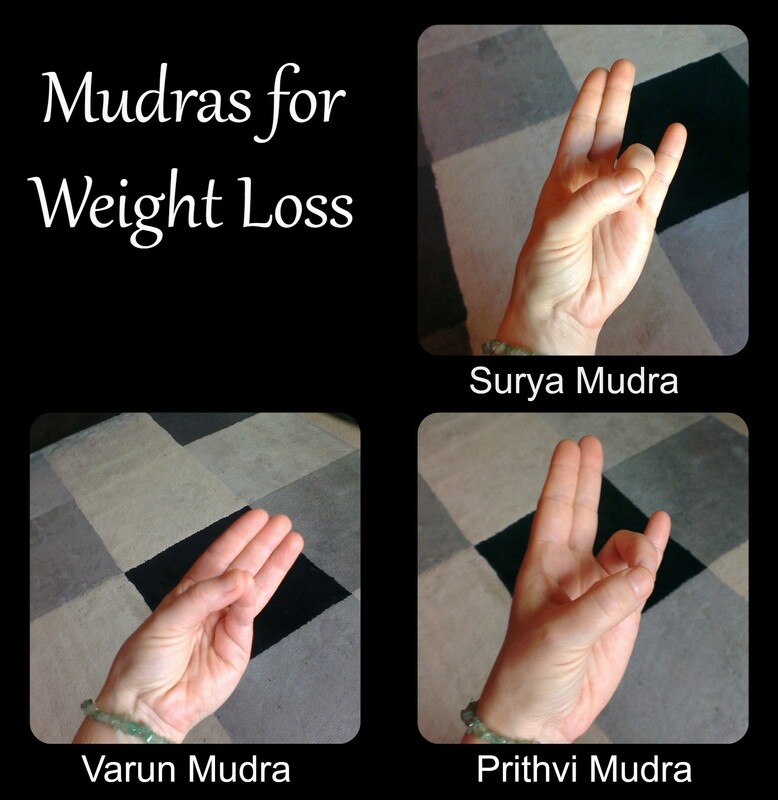 Hold each mudra for at least 5-10 minutes while focusing on the breath. The colour red can help you stay motivated to move more but it may not be a great colour for the kitchen as it can increase appetite. Blue plates (along with smaller portions!) is the way forward. Wear red for exercise to give you a boost if you are feeling lethargic and eat healthy red foods (berries are excellent) for extra energy. Most people tend to underestimate how much they actually eat. Writing everything down will help you keep it real and make healthier choices. Writing your meals down, along with the feelings you have before and after the meal, can help you understand any underlying patterns as well as work as a deterrent for overeating. Not everyone who is overweight have an underlying emotional issue but that food affects mood is a scientific fact so being aware of how you are affected by your dietary choices can only be a good thing. This is true as much for emotional wellbeing and improved sleep as it is for weight loss. Stick to journalling for at least one month to become clear about your patterns and to see if writing what you eat down is helpful. Grapefruit – helps raise the metabolism and stop fluid retention. Massage the diluted oil on problem areas such as thighs or stomach. Together with ginger, sandalwood and lemon essential oil, it makes a perfect anti-cellulite blend to use in the bath. Put a few drops of each in a cup of organic apple cider vinegar (with ‘mother’) as the dispersing liquid. Peppermint – the perfect appetite suppressant! Peppermint oil also helps your digestion if it is sluggish. Use in a diffuser between meals to prevent snacking and to reduce your appetite before meals. Bergamot – balances blood sugar, lowers cholesterol, boosts the mood and combats stress. Drink tea flavoured with bergamot or use in a diffuser to lift your mood. Also excellent for a relaxing bath that will leave you feeling totally recharged. Bonus Tip – Just Dance! The most holistic way to exercise has got to be improvised movement to music. It takes the focus off any perceived imperfections and allows you to enjoy everything that your body is capable of. Playing uplifting music will boost your mood as well as help you burn calories and you will start reconnecting with your creative Source by moving your body in time with your Soul. I hope you enjoyed these holistic weight loss tips.